These scrumptious muffins are a perfect treat for Thanksgiving, or serve them with breakfast or brunch anytime of year. Preheat oven to 325 degrees F/160 degrees C. Grease muffin pans or line with paper inserts. In the bowl of an electric mixer using the paddle attachment, cream butter and brown sugar until light and smooth. Add egg and egg whites and beat to combine. Sift together the flour, baking soda and salt then slowly add to the butter-egg mixture in batches. Scrape down the sides of the mixer bowl, then add the Pecan Pumpkin Butter, vanilla extract, orange juice and dried cranberries and mix to combine. Fill muffin molds 3/4 full. Bake about 25-30 minutes until a skewer inserted into a muffin comes out clean. 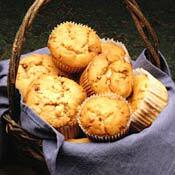 Remove muffins from pan and cool on wire rack. Muirhead Pecan Pumpkin Butter (which comes in a 13.5 ounce jar) can be purchased online at Williams-Sonoma.com, Muirheadfoods.com, and at Foodlocker.com. It may also be purchased at other stores online or at gourmet food stores. Absolutely fabulous! I did some minor substitions because of being diabetic. I used Altern (Splenda) instead of the white sugar; I used the half and half brown sugar. Substituted apple butter for the applesauce. I used oil and walnuts. The results were THE BEST muffins I have ever made! My husband agreed! Moist, perfect texture, and the walnuts gave it that crunch ... very delicious! Actually, I should have said in the previous review that I "substituted apple butter in place of the pumpkin butter."